Gluten Freeways: March is National Peanut Month! Did you know that March is National Peanut Month? Well neither did I, but just as I was preparing this post I went to my favorite peanut butter's website and was informed of this important month. So take a moment of silence to remember all of the peanuts that have been important in your life. OK, with that moment over, let me tell you about my favorite GF peanut butter! It is called "Peanut Butter & Co.," and the company makes a few great gluten free peanut butter flavors. 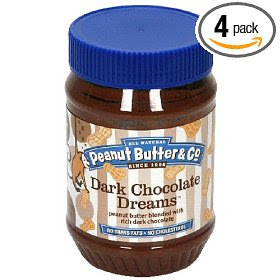 My personal favorite is the Dark Chocolate Dreams brand -- it's a great mix of dark chocolate and peanut butter (in case you couldn't figure it out). Peanut Butter & Co. labels all of their products "Gluten-Free" on the nutrition label if they are GF, so make sure to check the label for the most up-to-date information. To celebrate National Peanut Month, the company is offering a free Peanut Farmer Starter Kit with any $20 purchase made at our online store. Well okay, fine, I guess it isn't exactly free -- but if you stock up on some PB you can get a free Starter Kit too! Available in Ralph's, Whole Foods, and other markets; also available online. To check for a supermarket near you that carries the product, click here. great site....to your good health.. I have added your blog to the ever-growing list I maintain at the Crispy Cook (I have a link on the right hand sidebar) and blog about this list twice a year with all the updates. I look forward to more of your interesting posts.